FCI Notification is out. 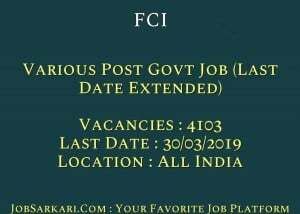 FCI is recruiting for 4103 Various Post Govt Job (Last Date Extended) Posts. You can check FCI - Food Corporation of India last date, download FCI notification, visit FCI official website and check other FCI Vacancy details.Complete Vacancy and recruitment Details about 4103 Various Post Govt Job (Last Date Extended) vacancies in FCI are provided below by JobSarkari.Com only for you. Last Date of Payment Application Fee. 30/03/2019. Mode of Payment Application Fees Can be Submitted through Online Mode using Debit / Credit Card / Net Banking or through Challan at SBI. Junior Engineer (Civil) 46 26 26 14 02 114. Junior Engineer (Electrical / Mechanical) 30 15 10 09 08 72. Steno Grade II 43 07 09 09 08 76. AG II (Hindi) 22 15 03 04 01 45. Typist (Hindi) 16 03 12 04 04 39. AG III (General) 256 159 106 124 112 757. AG III (Account) 287 48 87 65 22 509. AG III (Technical) 286 54 224 153 03 720. Total No. of Post 1999. 540. 538. 735. 291. 4103. Junior Engineer (Civil) Candidate Must Have Passed Degree in Civil Engineering or Diploma in Civil Engineering with 01 Year Experience. Maximum 28 Years. Junior Engineer (Electrical / Mechanical) Candidate Must Have Passed Degree in Electrical Engineering Or Mechanical Engineering or Diploma in Electrical Engineering Or Mechanical Engineering with 01 Year Experience in the Case of Diploma Holders Only. Maximum 28 Years. Steno Grade II Candidate Must Have Passed Graduate Along with O‘ level Qualification of DOEACC and speed of 40 WPM and 80 WPM in typing and Shorthand Respectively or Degree in Computer Science/ Computer Application with Speed of 40 WPM and 80 WPM in Typing and Shorthand Respectively. Maximum 25 Years. AG II (Hindi) Candidate Must Have Passed Degree with Hindi as the Main Subject. Proficiency in English and Having 01 Year Experience of Translation from English to Hindi and Vice Versa Maximum 28 Years. Typist (Hindi) Candidate Must Have Passed Graduation or Equivalent and Having 30 W.P.M Speed in Hindi Typing. Preference will be Given to the Candidates Knowing Bilingual Typing (English and Hindi) and Computer Knowledge. Maximum 25 Years. AG III (General) Candidate Must Have Passed Graduate Degree in any Discipline with Proficiency in use of Computers. Maximum 27 Years. AG III (Account) Candidate Must Have Passed Bachelor of Commerce with Proficiency in use of Computers. Maximum 27 Years. AG III (Technical) Candidate Must Have Passed B.Sc in Agriculture. Candidate Must Have Passed B.Sc with any of the Following Subject Botany / Zoology / Bio-Technology / Bio-Chemistry / Microbiology / Food Science. Candidate Must Have Passed B.Tech / BE in Food Science / Food Science and Technology / Agricultural Engineering / Bio-Technology and Proficiency in use of Computers. Maximum 27 Years. AG III (Depot) Candidate Must Have Passed Graduate Degree in any Discipline with Proficiency in use of Computers. Maximum 27 Years. 2. Candidate Need to Click on the Apply Online Link Given on Our Website in Important Link Section. Candidates Do Not Need to Register Again. 4. Candidate Need to Fill All the Mandatory Details in the Application form and read All the instruction Before filling the Form. Q. What is the Last Date For FCI Various Post Govt Job (Last Date Extended) Vacancy ? A. 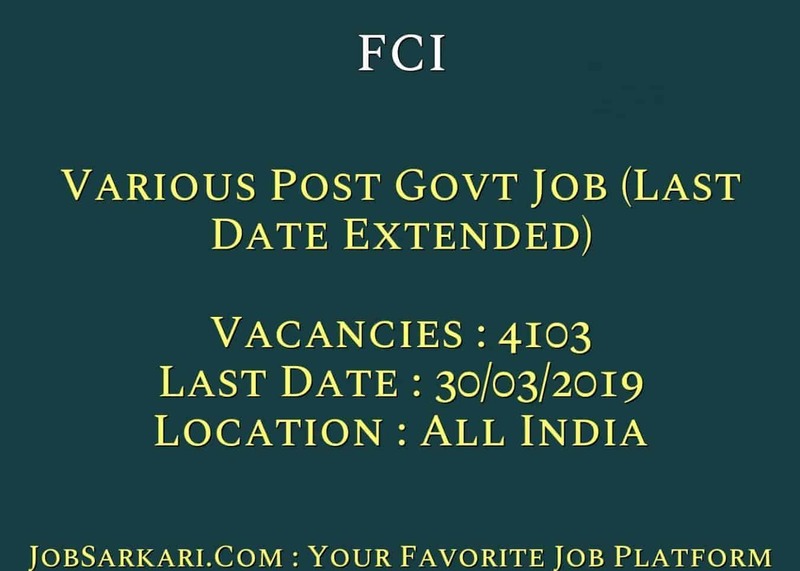 Last Date for FCI Various Post Govt Job (Last Date Extended) Posts is 30/03/2019. Q. What is the Form Type of FCI Various Post Govt Job (Last Date Extended) Recruitment ? A. The Form Type for FCI Various Post Govt Job (Last Date Extended) Posts is Online. Q. How many vacancies are available in Food Corporation of India Various Post Govt Job (Last Date Extended) Posts ? A. There are about 4000 Vacancies in Food Corporation of India Various Post Govt Job (Last Date Extended) Posts. Q. What is the Full Form of FCI ? A. Full Form of FCI is Food Corporation of India . BCA candidate can apply the application from? I am 27years 3 months old am I eligible for AG III post ? Yes, You Can Apply For This Post..
Nahi Aap do form nhi bhar bhar skte hain..
Ap iski notification me check kr sakte hain..